First Novel Prize 2017 runner-up Carolyn Kirby has sold the UK and Commonwealth (excluding Canada) rights to ‘Half of You’ to No Exit Press, a Hertfordshire-based independent publisher. The publisher acquired the rights from David Haviland at Andrew Lownie Associates, who signed the author up following a streak of competition successes recognising the book’s many achievements. In the US and Canada, ‘Half of You’ will be published by Dzanc Books. ‘It’s hard to overstate the importance of The First Novel Prize in giving me confidence to keep going as a writer. A year on, everything looks very different. Winning second place in the Prize not only opened doors, it more importantly restored my faith in writing,’ author Carolyn Kirby said. ‘I was thrilled to hear that ‘Half of You’ was snatched up by two great independent publishers. From the moment I read it, I knew one day I would see it in print. It’s just the beginning of a brilliant future for a book, a character and an author like no other,’ Lorena Goldsmith, First Novel Prize 2017 co-judge, said. Carolyn Kirby, winner of the Second Prize in The First Novel Prize 2017, has won The First Novel Award 2017, organised by the Bluepencilagency and judged by literary agent Eve White, with ‘Half of You’. Following this, Carolyn has been signed up by David Haviland, literary agent at the Andrew Lownie Literary Agency. ‘The premise of genetics set in 1880’s Birmingham is interesting and Carolyn’s writing was strong,’ noted Eve White. Annetta Berry, winner of the First Prize in The First Novel Prize 2017, has been signed up by the literary agency C+W. 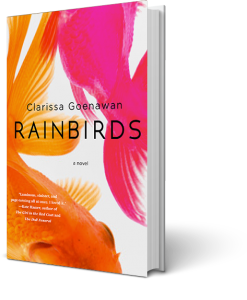 The rights to Clarissa Goenawan’s Rainbirds, Third Prize winner in The First Novel Prize 2016, have been sold in ten territories. The novel, an internationally recognised literary debut, is due to be released in March 2018 in English by Soho Press in the US and by Math Paper Press in Singapore, and shortly followed by translations in Chinese (Simplified) by Beijing White Horse, in French by Les Escales, in Hebrew by Tamir/Sendik Books, in German by Thiele Verlag, in Indonesian by Gramedia, in Polish by Prószyński Media, in Spanish by AdN/Alianza, in Turkish by Hep Kitap. But Ren soon finds himself picking up right where Keiko left off, accepting both her teaching position at a cram school and the bizarre arrangement of free lodging at the wealthy Mr. Katou’s mansion, in exchange for reading aloud each morning to Katou’s depressed, mute wife. Struggling to fill the void that Keiko has left behind, Ren realizes that perhaps people don’t change, and if they don’t, he can decipher the identity of his sister’s killer.